Someone emailed me a story about Itzhak Perlman, the renowned violinist, that contained some profound words he spoke. I don't know the original source of the story, so I can't give credit.... but it was obviously told by someone who had attended a Perlman concert. On November 18, 1995, Itzhak Perlman came on stage for a concert at Avery Fisher Hall at Lincoln Center in New York City. If you've ever been to a Perlman concert, you know that getting on stage is no small achievement for him. He was stricken with polio as a child, so he has braces on both legs and walks with a aid of two crutches. To see him walk across the stage one stop at a time, painfully and slowly, is an unforgettable sight. When he reaches his chair, he sits down, slowly, puts his crutches on the floor, undoes the clasps on his legs, tucks one foot back and extends the other foot forward. He bends down and picks up the violin, puts it under his chin, nods to the conductor and proceeds to play. By now, the audience is used to this ritual. They remain reverently quiet until he is ready to play. But this time, something went wrong. Just as he finished the first few bars, one of the strings on his violin broke. You could hear it snap -- like gunfire across the room. There was no mistaking what that sound meant. There was no mistaking what he had to do. He would have to get up, put on the clasps again, pick up the crutches and limp his way off stage -- to either find another violin, or find another string for this one. Instead, he waited a moment, closed his eyes and then signaled the conductor to begin again. The orchestra began, and he played from where he had left off. And he played with such passion and such power and such purity as they had never heard before. You could see him modulating, changing, recomposing the piece in his head. At one point, it sounded like he was de-tuning the strings to get new sounds from them -- sounds they had never made before. When he finished, there was an awesome silence in the room. And then people rose and cheered. Everyone was on their feet, screaming and cheering, doing everything they could to show how much they appreciated what he had done. He smiled, wiped the sweat from his brow, raised his bow to quiet us, and then said -- not boastfully, but in a quiet, pensive, reverent tone -- "You know, sometimes it is the artist's task to find out how much music you can still make with what you have left." Perhaps our task in this shaky, fast-changing, bewildering world is to make music, at first with all that we have, and then, when that is no longer possible, to make music with what we have left. My thanks to whoever it was who attended that concert in 1995 and wrote this account.... and my thanks to whoever sent the story along to me. 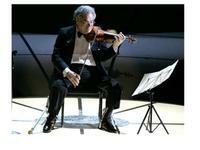 And coincidentally, Itzhak Perlman is scheduled to perform with the Nashville Symphony this year.